Whatever it is you’re pursuing in life, I think it’s important to have clearly defined goals. You need something to pull you along and move you towards your end destination. Not to sound too woo-woo, but when you’re fully taking advantage of the reticular activation system built within your very mind, you begin to see things you never saw before. You begin to key in to opportunities you weren’t previously aware of. The resources, the people and the circumstances start lining up in incredible ways. However, if you don’t set goals, you’re not giving God and the universe a chance to bring you what you need. Not that it will magically land in your lap or anything, but you can make your focus and intentions clear, and when you are clear on those things, you become a force to reckon with. 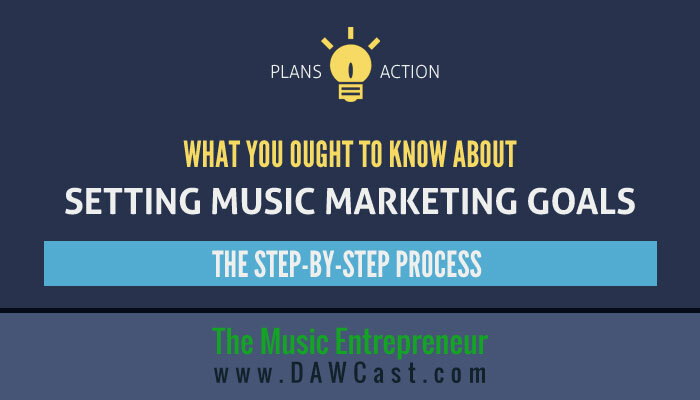 So, let’s take a look at setting music marketing goals. This is probably the toughest part. Before you do anything else, you need to become clear on your goals. You have to be as specific as possible. When you really think about it, that’s not really a goal at all. It’s just a general comment. At worst, it’s a wish. Wishes do not translate into goals that motivate. If your desires are strong enough, if your dream is big enough, you will be prompted to take massive action towards the fulfillment of your vision every single day. Furthermore, you should be able to image it vividly in your mind! I’ve talked a little bit about goal-setting before, and though I don’t believe in being formulaic, I think it’s a good idea to make your goals SMART. That means Specific, Measureable, Achievable, Realistic and Time-Bound. Now we’re getting somewhere. The question now is really whether or not that seems achievable and realistic to you. You have to know the variables and adjust them to your particular situation. This is a basic step, but a very important one nonetheless. Most personal growth experts will tell you that your goals are pretty worthless unless you write them down. Okay, they don’t usually say worthless, but if they were being blunt, that’s probably what they would say. Don’t take my word for it. Go ahead, do your own research. Again, it may sound a little mystical, but the act of writing down your goals will significantly increase your chances of actually achieving them. I might even go so far as to say if you do nothing else, do this. There are many stories of people who wrote their goals down only to come back to them much later, and discovered that they had accomplished a huge number of them! With your goals written down, your next step should be to plan and strategize how you’re going to accomplish them. This is where being realistic really pays off. If you’re busy with your day job, and you have no energy, and all you have is 30 minutes a day to build towards your goals, you’re going to have to be pretty focused! If you’re about to initiate a massive undertaking, and you hope to get it done by next week, you’re probably not being terribly realistic. You might want to loosen up your timeframe a bit. Everything takes time and energy. If you’re in pursuit of a worthy goal – most of the time – it will take longer and be harder than you ever imagined possible. So think of this in terms of what you can do every single day consistently, especially if you’re in your adult years. Even if you only took five swings at a tree with your axe every single day, though it wouldn’t fall today, it would eventually fall down, right? The tree is your goal. The swings are the actions you take to move closer to it. If you keep at it, you’ll reach it. Whenever you’re working towards a goal, think about the actions you can take on a consistent basis. Consistency builds momentum. You’ve identified what your goal are, and you’ve written them down. You’ve taken the time to plan and strategize. You’ve thought about the actions you need to take to get to where you want to go. Congratulations! You’re now further along than most people will ever get. But don’t stop now. You’ve come this far, so you might as well put your plan into motion. It’s nice to visualize the realization of your goals, and I do think there is tremendous benefit to doing that, but ultimately you have to do something about them. Reach out. Ask for help. Don’t try to do it all alone. Most if not all of us need the support of trusted friends, colleagues and mentors to bring the best out of us and our dreams to fruition. But most of all… go, go, go! Don’t think about it too much. Start doing the work. You’ll make some mistakes, and you’ll have some failures along the way. You might even experience some frustration and embarrassment. If you risk nothing you gain nothing, so this is just part of the process. If you’re always in “go” mode while you’re driving towards your goals, you’ll be amazed at what you can accomplish. Once it’s all done, you need to take some time to think over how things went. Many times, goals are not accomplished in their given timeframe, but if you stayed true to the cause, you probably came much closer to achievement than if you hadn’t made any plans. Now don’t get me wrong here; if you’re a little behind, but you’re still gunning it towards your goals, don’t stop! But rest assured there are going to be a lot of valuable takeaways from your journey, and unless you take some time to reflect on them, you may miss out on some key lessons. These are the kind of lessons that will supercharge your progress in the future. This is also a good time to think about how you would do things differently next time around. Some things probably worked well, while others didn’t. In most cases, 20% of your work delivered 80% of your results. Really think about what that 20% was, and then become more dedicated to that 20% next time around. You probably came here expecting to hear about the what you should be doing to reach your music marketing goals. In other words, you may be looking for specific tactics and techniques that have to do with music marketing. So why in the world would I be teaching you the how and the why? Most people already have great ideas; especially if they read articles or listen to podcasts and educational audios regularly. Mindset issues tend to be a bigger deal than the exact steps involved in social media marketing, crowdfunding, advertising, etc. Your motivation matters more than the steps you take. The fulfillment of your goals is less platform-specific (i.e. Facebook, blogging, etc.) than it is objective-specific. Your exact plan will differ from anyone else’s, because it’s contingent upon your goals. Moreover, plans usually end up being tweaked, because the plan you start with isn’t the one that will get you to where you want to go. With that in mind, here is a hypothetical example of a music marketing goal. By default, I often end up using the example of an album release, so this time I will use live performance as an illustration. We’ll say that you’ve decided to book the local community hall for a live performance. The venue’s capacity is 300, and it’s going to cost you $600 for the night to rent it. Assuming you can pack out the room, you can set the ticket price to $2 and break even on the venue costs. However, you really want to make this a great night, offer some refreshments, and share the stage with another great band, so you’re going to charge $15 per head. Moreover, you’re not sure that you’re going to be able to bring out 300 people, so you’re going to assume that the ticket price is going to more than make up for the difference. You set a date for three months away, because you want adequate time to prepare for the upcoming performance. Now you have all of the basic facts in front of you. You can certainly set goals without accounting for all of the variables, but you can see how it’s going to make it a little easier. Since you’re not sure about drawing a crowd of 300, you’ve settled on 200 as your objective. It will stretch you a bit, but you think it’s doable. We will perform for a crowd of 200 at the local community hall on September 1, 2015, and charge $15 a head for the show. If that was your goal, then you wouldn’t take it any further than that. But hold on a second. There’s more to this, isn’t there? If you have a long-term mindset, then the purpose of the show isn’t the show itself, right? The purpose of the show is to make money, make fans, sell merch, get email signups and so on. We will earn $30,000 in live performance earnings by December 31, 2015. The lesson here is that, first, there’s the goal. Then there’s the activity that leads to the goal. And then, there’s the aftermath. When you’re building a music career – in a sense – the aftermath is really every bit as important as the goal, because you’re hoping to use every opportunity as a bridge onto the next thing. That’s why a big picture goal is important, but it still needs to be specific. If you’ve done your homework at the strategizing stage, hopefully you’ve mapped out the various things that you’re going to have to do to get to where you want to go. A show is never really the goal unless it’s your goal to play one show. That show is supposed to be a building block to something more, yes? I think the challenging part in discussing music marketing goals is that a music career doesn’t really have a beginning or an end. Or, at least in the abstract mind of the artist, it’s hard to process that information. Many musicians feel that they’ll just keep on playing until they can’t play anymore, whether that’s based in any permutation of reality or not. I’ve had my fair share of difficulty with goal-setting too, because I find it hard to settle on any one thing. I have goals, and I’ve written many of them down, but it can be hard to figure out where to start. So I’m definitely not saying that goals are easily made, but the effort is worth it if you can gain clarity in your thinking. It’s hard to maintain focus when your mind is running in dozens of different directions. However, like most things in life, there isn’t necessarily an exact trajectory to follow. You will find that just about everybody’s story is a little different, and their journey was often a winding, squiggly path that led them to where they are today. Let your path unfold before you. Don’t try to control the journey. Simply identify your destination on the map, and chart a course to get there.